On Wednesday, April 18, Joan gave a presentation about her book, For the Sake of the Children, to Hadassah of Suffolk. The talk was at the Greens at Half Hollow, and was attended by more than 60 guests. The audience was very interested and asked thought provoking questions after the presentation. 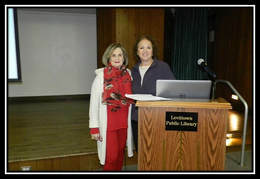 Thank you to Phyllis Foodim and the entire Hadassah chapter for inviting us to their meeting to speak. We hope to partner again in the future! ​On Sunday, February 18, Joan Adler spoke to the Jewish Genealogical Society of Sacramento. Her presentation was about the book My Family: I Could Write a Book by Edith Maas Mendel. This talk focused on how to document family history through writing and was followed by Q&A. The event was enthusiastically received. During her trip to the Bay Area, Joan visited with several Straus family members. On Wednesday, January 24 from 1 pm to 3 pm, Joan Adler gave a presentation to the Meadowbrook Women's Initiative at the Levittown Library. Her talk was about her book, For the Sake of the Children. Around 50 people attended this event and after the talk, participated in a Q&A with Joan. The presentation was such a success and we are excited to partner again in the future!